When you move apartments in the middle of Los Angeles Food & Wine weekend, you still make an effort to attend at least one session. It would be last Friday night’s Asian Night Market in my case, and the results were pretty fantastic. 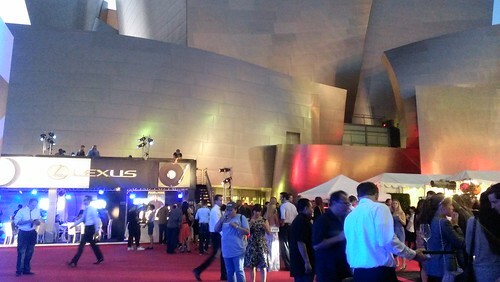 The main venue of the event was a nice, less commercialized change-up from the Nokia Live Plaza venue of years past. Instead, we got to bite and sip in the foreground of Frank Gehry’s beautiful Walt Disney Concert Hall, which did a lot to augment the classy feel of the series of tasting events (at least it did for the night I was able to attend). Speaking of class, Matt Biancaniello prepared oyster infusions for guests that included a couple of the mind-boggling combinations he’s so well known for. He used a Aloe vera liqueur from Chareau, the founder (Kurt Charron) of which was on hand to talk about his product. We tried oysters with Shiso infused rose, Cocchi Americano, cotton candy grape and blueberry juice air with roasted hatch-infused aloe vera. A Scotch version came in the form of an oyster with Laphroaig infused with bronze fennel, papalo oil, hatch infused aloe vera as well as Chareau. Bryant Ng of The Spice Table served up spicy grilled beef ribs in an herbed lettuce wrap with pineapple-anchovy sauce. Chris Oh of Seoul Sausage made kimchi fried rice and pork sausage fried balls. Arancini if you’re Italian, fried onigiri if you’re Japanese. (By the way, this was the Asian Night Market.) I especially loved both these flavor combinations in their respective packages. Starry Kitchen, for once, didn’t have the balls to direct everyone to put into their mouths. In true form, though, Nguyen busted out the speaker phone for some intermittent announcing. You knew you couldn’t hold him down, right? Chili crab gumbo and pandan flan were on the menu and they were all the more energetic for it. 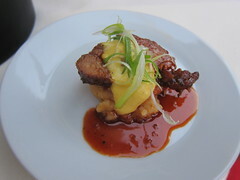 Ricardo Zarate came to represent his three restaurants (Mo-Chica, Picca, Paiche) with a pork neck gochujang that was as tender as it was flavorful. I went back for a second. 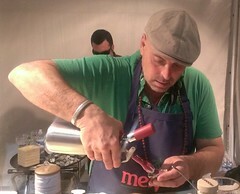 David LeFevre of M.B. Post and now Fishing With Dynamite made cha soba and blue crab with shiso, red radish and ginger-apple ponzu for the Asian Night Market (emphasis mine) and it was a welcome refreshing yet aromatic bite. There were abstract Asian offerings, like Peking Duck cotton candy (?) by Joe’s Stone Crab, tempered by an offering of tastefully rich cups of Duck ramen. Unfortunately, I missed David Meyers and Kuniko Yagi’s bite, as I heard they had chili crab toasts to represent Hinoki and the Bird. But between the food and the delicious wine being poured by all the representative wineries, can you blame me for not getting absolutely everything in? Good thing I’m not the kind of girl who moves apartments every year. Next year, whether for more lunches or grand tastings, I’ll be sure to clear my schedule. 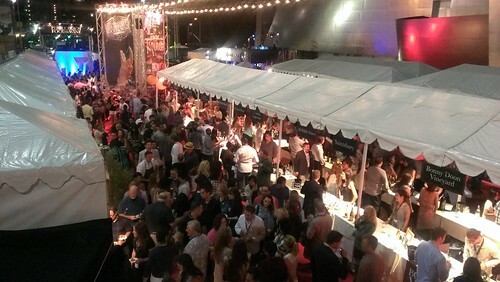 This entry was posted in beer, cocktails, Downtown LA, Events, Food, Food truck, L.A., wine and tagged Asian Night Market, bites, Downtown LA, DTLA, Grand Tasting, LAFW, Los Angeles Food & Wine, night market, Walt Disney Concert Hall, wine. Bookmark the permalink.